There are some variables that allow the description of the different electronic voting systems. There are two main systems: on-site and Internet voting. The on-site voting system is the most used around the globe because if the security guarantees it offers: trust, because votes can be audited, interaction/retro alimentation experience between the equipment and the voters, because the vote count is assured, and the inclusion of disabled voters. We will now see the characteristics of the multiple forms that e-voting have. There are systems that register votes and include the identification and the reading of electoral ballots, as well as electronic direct recording in the memory of the voting devices. The systems may be distinguished according to the voting instruments, such as the optical scanners that use the ballots as the principal instrument when casting the votes. These systems keep a tangible proof of vote. DRE systems are also used in on-site voting, which have a screen or keyboard as the main instrument for casting the vote (instead of a ballot). In some cases, they may have printed proof of the votes. On one hand, the optical scanners provide automated vote counting, which uses an optical scanner that recognizes the ballots that is manually introduced into the machine, in order to preserve the proof of vote. The device then identifies the ballots and registers the vote, totalizing then in the machine’s memory. This voting system can be classified according to the type of ballot that is used: nomination ballot system (that uses a recognition code) or multiple ballot system or manual marking (that uses circles or rectangles to mark the voter’s choice, which are filled by each voter). These systems (optical scanners) have been proven in various countries such as United States, Philippines, England, Norway, Belgium and Venezuela. On the other hand, DRE systems allow voters to use different instruments to cast electronically their votes and receiving a direct feedback from the machine. These systems (contrary to the optical scanners), they not necessarily require the use of ballots, as registration can be made directly on the machine, and its Reading is done by a computing device built into the voting machine. This system may include instruments such as keypads, touch screen, magnetic stripe card and laser pointer, computer and console keyboard. For the vote registration, built in memory cards are used, with separate reading machines. Currently, Venezuela uses this modality, with proof of votes. Brazil also uses this system but do not use the printed proof of vote, even though they are studying its implementation from 2014. The sophistication of technology has allowed governments to have many tools to automate the elections, and even technify stages prior to the election (registration, application). However, the power of progress has made possible the application of Internet voting, as on-site voting. While on-site voting is exercised by an electoral college and is currently the most applied around the world, online voting is just starting, but is one of the two options that have to be automated in an electoral system. Regardless of the technological possibilities offered by each, when it comes to their adoption, the nations ponder on which of them mean less risk according the need of preserving an election’s principles: secrecy, to be universal, free, equal and direct. 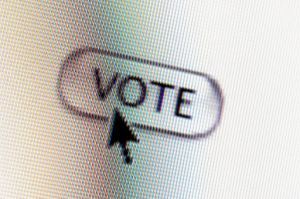 In the race for winning new markets, online voting hasn`t had many things on its favor. It may be ideal for each voter to have the right to vote from his or her home, but the security requirements haven’t yet passed the test. This is an Internet based system, which allows any voter with a computer or any other device with an Internet connection, a mobile phone or digital TV. Each voter is assigned with a unique digital ID number that is protected with complex encryption processes, which enables Access to a site where the election is done. After the cast is voted, it travels through a transmission network to a totalization center. Countries such as England, France and Spain have made pilot trials but have not yet decided on its adoption, mainly because the Internet access is yet limited, violating the universality and equality principles. They also question the anonymity certification, as the id number does not eliminate phishing. They also point out that the freedom in voting is not guaranteed, as al election might be forced. Other postures exist regarding the security and secrecy of the vote, as there’s no software that guarantees 100% remote voting. Despite this, Switzerland has started to implement a system that enables online voting, and hopes to extend progressively the use of this tool. On another hand, on-site electronic vote is being successfully implemented in over 30 countries. With this system, the voter must go to traditional voting stations where he or she uses electronic voting machines and ballots. There are many mechanisms to fulfill the premise of automation, but the main are Voting Optical Scanners and processes of Direct Recording Electronic (DRE). United States, Philippines, England, Brazil, Norway, Venezuela and Belgium have adjusted e-vote according to their legal needs and idiosyncrasies. The United States, for example, use mixed systems (touch screen machines but with no paper record of the votes, and paper ballots for voting and optical scanners for counting). 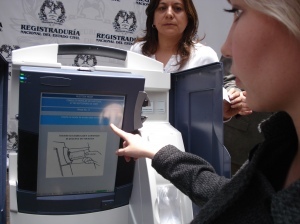 Venezuela has a system that is 100% automated, provided by the company Smartmatic, which registers the votes through touch screen machines that issues the proof of vote to enable the audit. The system also has electronic ballots for multiple candidates’ elections. On-site electronic voting have many critics, however the experts designers of voting systems have been covering the different requirements and needs of the countries facing new challenges. The mission is to continue searching for new and better tools to meet the guarantees of transparency, speed and reliability. Both, on-site and remote vote are a reality. It’s up for each country to study which devices are more suitable for their laws and culture. Technology changes at a fast speed and is waiting for the citizens to be able to vote in a secure way, but also taking advantage of the advances technology offers.